While I'm a lettering artist who loves to letter with paper and pen, sometimes I feel like I want more than just that. The colors I'm limited to are only what the pen companies produce, what I can purchase and how much I'm willing to spend amassing my pen collection. Do I really need to purchase another blue pen in the hopes that this one will finally be that exact shade that I've been looking for (heads up, it probably won't be)? 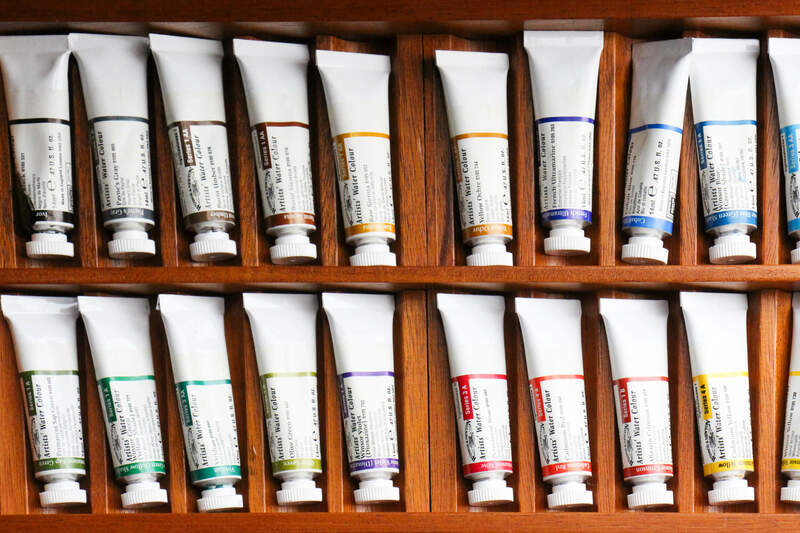 But with watercolor, one single tube or pan of colors provides a variety of shades, saturations, colors and effects. I'm not spending money on one pen that can function one way, with watercolor I am investing in potential and possibility. But those amazing colors and beautiful brushes are nothing if you don't know how to wield them. One of my favourite times of the week is when my daughters and I grab their watercolors, slap huge sheets of paper down on the kitchen table and start to play. When I first started doing that, I quickly realized that lettering with watercolors is not as easy as I expected (surprise, surprise). What started as time with my daughters became something that I became intentional about in order to learn to master the paintbrush, blend my colors and make letters that looked crisp, clean and intriguing every time. When I first started watercolor lettering, honestly it was hard! My brush bristles would separate on turns, colors looked washed out when they dried and I was never happy with the final product. But then I figured it all out! In this course, you will learn all of those secrets! Blend like a pro with colors that will pop off the page and make people wonder just how you did it. Learn exactly how to choose your materials, techniques and supplies for success. 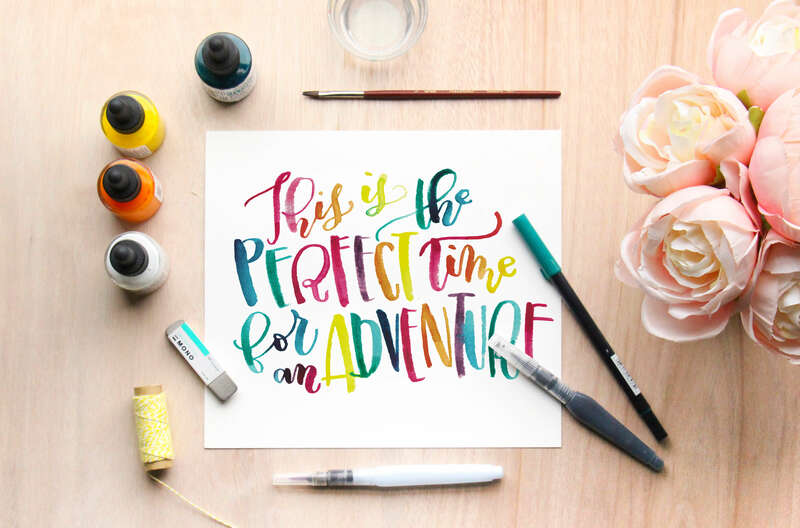 Scale up your watercolor lettering to make stunning massive poster sized watercolor pieces. I knew something else was missing because another beautiful part of watercolor is the painting part. And I am not a painter! That's where Fiona Moes Pel comes in. As a watercolor artist and a certified art teacher, Fiona breaks down botanicals into easy-to-follow steps. Now, not only are you lettering with watercolors, but you're painting botanicals, filling your page and pushing yourself even further creatively with new skills and techniques. 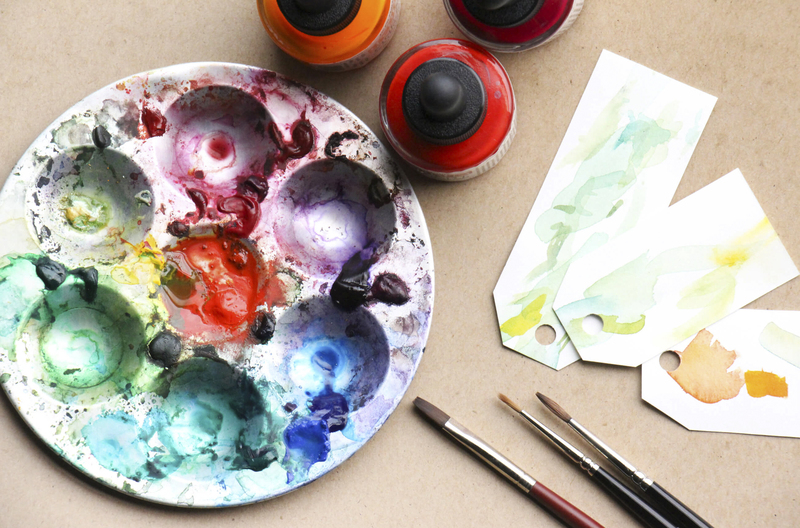 Discover exactly how to use color and balance it perfectly throughout your piece. Create botanical elements and florals with simple shapes and techniques that you can master. 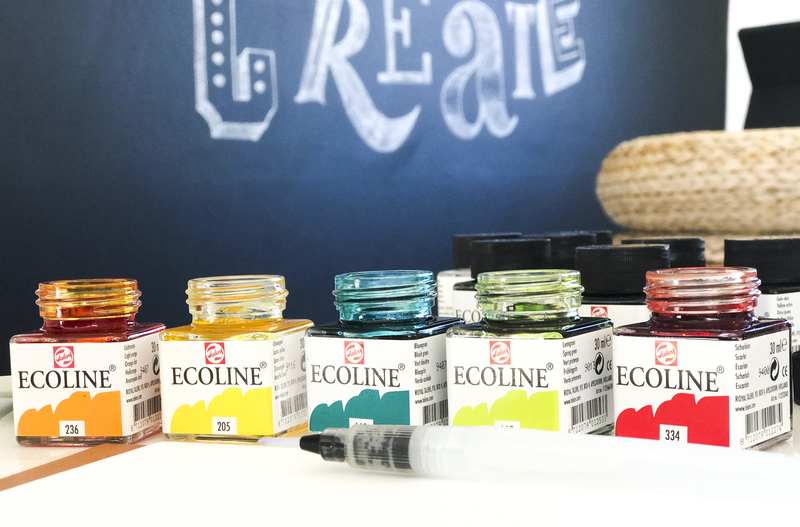 Mix all of those elements together to enhance, embellish and complete your watercolor lettering. Watercolor and Beyond is designed for you if you have some experience with lettering but you want to expand your skill set with brightness and beauty. You may want to be able to offer new products to your customers or friends, create gallery worthy art for your home or other's homes or just add some more color into your life! If you are new to watercolor use or you've struggled to make watercolor behave the way you want, this course is for you. You may not have perfect paintbrush skills, but that doesn't mean you can't wield one like a boss!! 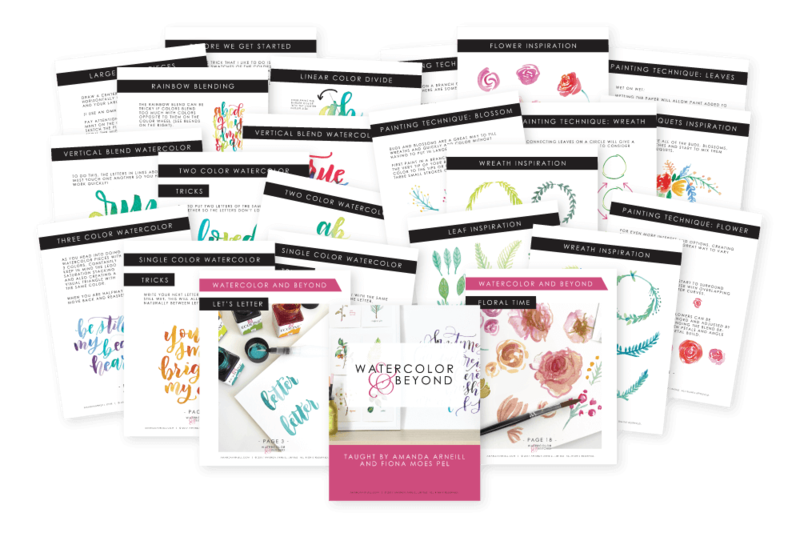 By the way, if you're new to watercolor lettering, or nervous that you're not "intermediate" enough for this course, I've created a bonus Intro to Watercolor Online Course that will be automatically be given to you as well. 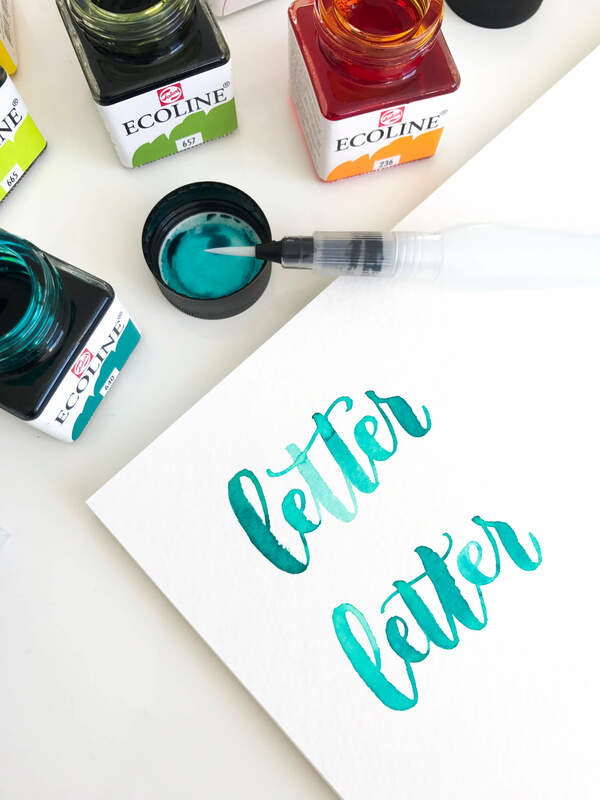 There's nothing that I won't do to make sure that you are totally prepared for the gorgeous watercolor lettering and painting you'll learn here!! 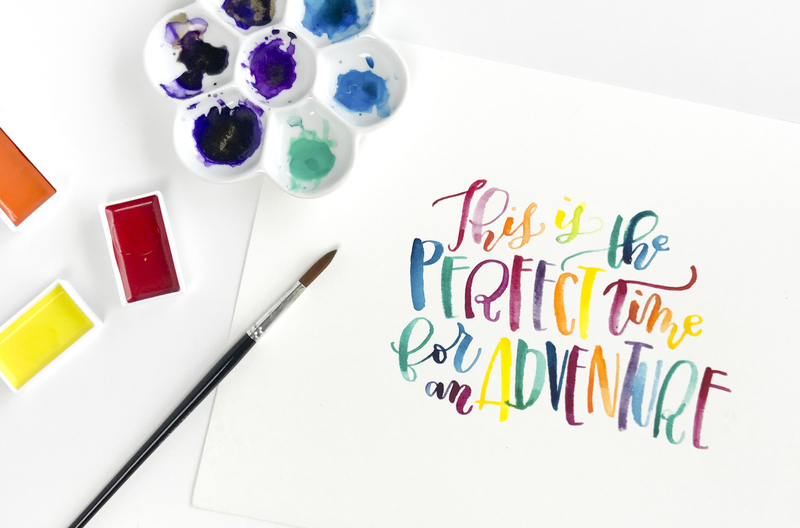 With over four hours of video instruction that you can go back and revisit anytime and a comprehensive workbook to have you lettering and painting with confidence, this course will have you grabbing your watercolor paints any chance you get! 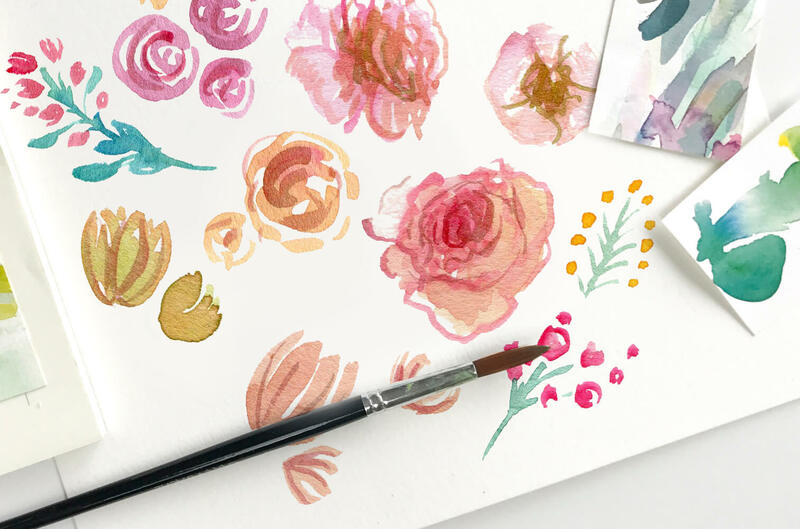 Following Fiona's step by step instruction, I was able to learn how to create my own floral elements... and as a someone who isn't a watercolor artist, if I can do it, you can do it too!! One of my past students, Tina, was also was having the same frustration with watercolor lettering. She had tried it over and over again and always felt like she was missing something. But after doing the Watercolor and Beyond course, watercolor has become like second nature to her! "Watercolor always intimidated me. I never really knew what I was doing and ended up messing up my work over and over again. I was so frustrated with all the time I was putting in, only to have to toss it in the trash. Then Watercolor and Beyond came along! This course is full of simple tricks and tips that prevent you from frustration! Amanda naturally moves you from the basics to more complex pieces using different colors, techniques and blending. One of my biggest issues was making my piece look cohesive when using more than two colors. Thanks to Amanda's triangle method, all my compositions look perfectly consistent now without any effort! I loved that this class was not only about watercolor lettering, but also about drawing botanicals with a second instructor! Fiona makes it easy to understand the color theory and walks you through drawing leaves, flowers and ever wreaths like it's nothing. I highly recommend this class for beginners and advanced letterers who want a clear and straight forward approach to watercolors to enable their own mastery of paints. This course made me absolutely fall in love with watercolors! I am now able to create beautiful, unique and cohesive pieces using different colors and multiple techniques. I pick up my water brush more often than my brush pen now!" Why Trust us to teach you? Artists are great and we love artists. We both are artists in our own rights. But being an artist doesn't necessarily mean that you are a good teacher. Being a good teacher takes education, years of practice and experience and, most importantly, the ability to equip the student with an internalized understanding of the topic being taught. Teaching is not something that you can stumble into. 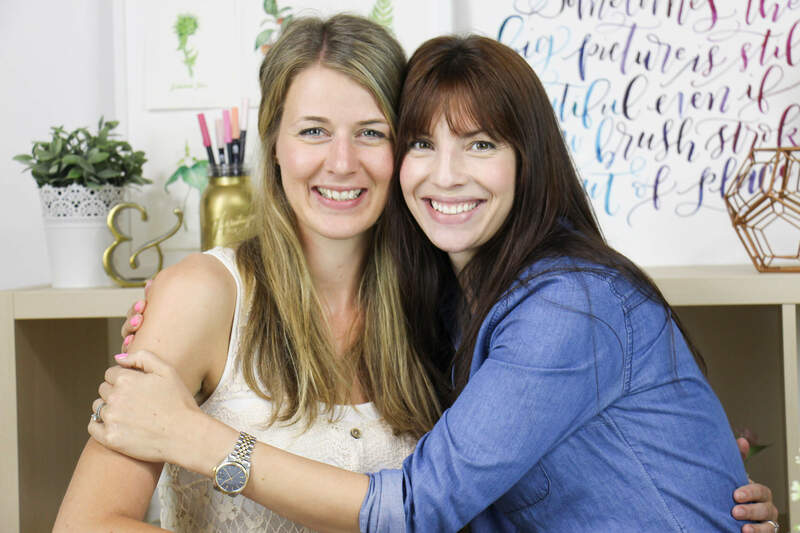 And that's a big part of what makes Fiona and me specially equipped to teach you about watercolor lettering, botanicals and effects to enhance your lettering. We have the artist stuff down, but we are also both trained, certified and qualified teachers who have real teaching experience. That means that, not only do we know how to paint, but we know how to teach it to you as well. Those who can, do and those who can... also teach! Your access doesn't expire! Take your time, practice as you go and, if life gets busy, don't worry. You can always come back to the course and pick up right where you left off. What supplies to I need to get started? some watercolor paint. I suggest steering away from the cheaper paints because, while there may be so many pretty colors (you know I'm looking at you Michael's watercolor paint), the paint is actually quite chalky and the colors aren't as vibrant as they could be. I use pan watercolors, tube watercolors and concentrated liquid watercolors. I love tossing a bottle of liquid watercolor into my bag and whipping it out in Starbucks as I enjoy my hot chocolate (like all normal grownups). ...and paper. Some paper will allow your brush to glide along the surface more easily. 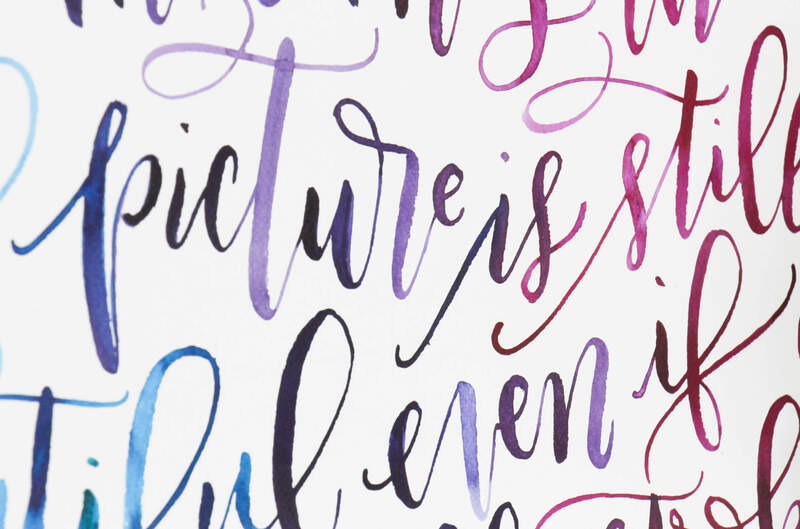 My favourite practice paper for watercolor lettering is this paper from HP. It is also an amazing and affordable paper alternative for your brush pens as well! For final pieces, I love to use Mixed Media paper! It takes the watercolor well, keeps your colors vibrant and isn't too hard to letter on. What if I have no experience with watercolor lettering? That's no problem!! While this is an Intermediate level course which assumes some lettering knowledge, I've created a bonus Intro to Watercolor course which you will automatically get access to with registration in this course. How does the course work? Is it online or live? Each course is an online course that primarily teach through professionally produced video modules. 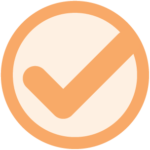 Each module is made up of a series of lessons that you can work through at your own pace on your own schedule. Along with each of the courses, there are printable cheatsheets, worksheets, letter guides, workbooks or other course materials to make you 100% successful by the time that you finish the course. The videos are there to help teach you the skills and the downloadable printables are there to ensure that you master them. Here’s where things get fantastic… if you keep your eyes peeled and you sign up for the courses during their prelaunch phase, not only will you get courses for the absolute cheapest price, but I always have extra bonuses that I send to my early registrants. 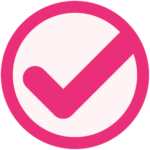 I also have a Diamond Status Program for students who take more than one course with me. As your courses add up, the bonuses do too! It's scary signing up for an online course. 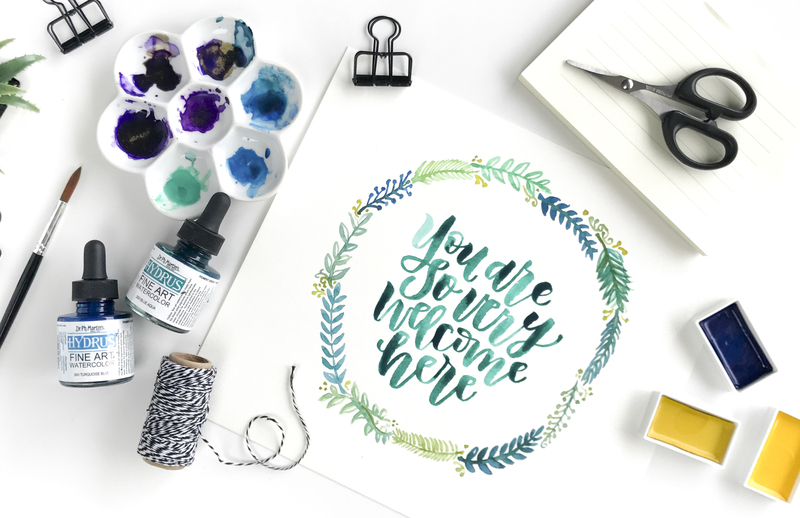 It's scary handing your money over, not knowing the learning experience that you're about to step into, but know that this course was meticulously planned out from start to finish to give you an immersive experience in watercolor lettering and painting. We know that everyone learns differently so, when we teach it one way, we also give alternative methods and options to ensure that we target the way that you learn. We wouldn't be good teachers if we didn't provide options for everyone to have success! Not a natural... so what? As a kid, I was pretty proud of some of the artwork that I would create. I thought I was so good at drawing and I loved to play around with different art supplies. A couple of years back, my mom said in passing, "You actually weren't very good at art when you were little." Well, crush my soul. Okay, so maybe I wasn't awesome, but I loved to play with my supplies. And that desire and willingness to explore art did help me to improve. I may not have been blessed with a natural gifting for painting or art but that has never stopped me. And it shouldn't stop you either. You don't need to be a painter in order to paint. You just need to be willing to pick up a brush, dab it in some paint and let us take you on a journey. Join us and become excited to pick up that brush every chance you get!